20.00 – “Feministic Pencil” exhibition opening (curators Victoria Lomasko and Nadia Plungian, Moscow). Excursion by Victoria Lomasko. 16.00-17.30 Tatiana Volkova. Activist Art and Tactical Media: World Development and Russian Experience. 18.00- 21.00 Anya Sarang, Alexander Delphinof. 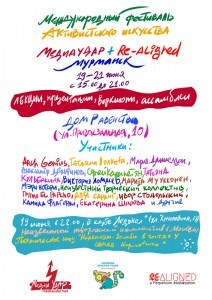 20.00-21.00 – mini-presentations of the projects of Murmansk participants – Arch Genius, Tatiana Kulbakina and others. 16.00 – 19.00 Ivor Stodolsky, Marita Muukkonnen, Ekaterina Sharova. RE-ALIGNED ART presentation.